I’ll be 60 this year . . . there I said it! Can’t believe it. I remember when Drew came home with a Zorn’s blueberry pie and stuck 2 candles in it — a 5 and a 0. The girls were home and my mom was there. I stared at the 50 and plotzed! That’s half a century. It was hard but I smiled, blew out the candles, and guzzled down most of the pie. Drew and I have been easing into the lifestyle of the Early Bird Specials. Like I said yesterday, we joined 2 theater groups and have tickets to the Saturday matinees. We say we picked this time because we don’t like to feel rushed during dinner. We see a matinee and then take a leisurely stroll around the city — pointing out all the nice brownstones we’d like to live in, drinking a beer, eating an appetizer, and deciding whether we should call the girls to see if they want to meet for dinner. The one problem about matinees is what to do for lunch. I just need to have something handy when my stomach gets chatty. I’m fine with a banana. Drew needs real food. Yesterday I bought a banana in a deli. I chose one that was large and so very slightly green at the tip. I would say it was ripe with no signs of browning on the skin. “You like brown bananas. This one isn’t ripe enough for you. Pick this one,” he points to a brown banana. “No I don’t. 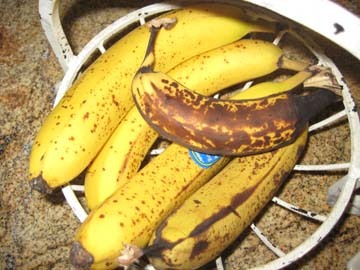 That’s Hannah who likes the real ripe bananas. This is the way I like to eat bananas,” I say holding tight to the banana of my choice. “I like ripe bananas for my milk shake,” I explain. “Oh, I was just telling someone at work how you buy brown bananas,” he feebly says. Ah, my drew, I guess you’ll have some explaining to do on Monday! We saw the Whipping Man. Enjoyed it and then walked over to MOMA til closing. Dinner at St. Andrews. Drew sampled several scotches and I had a bass ale. I just wonder what the crowd is like on a Saturday night instead of a matinee? Sometimes it seems to soon to be hanging with the matinee crowd. But then again, we were home by 9:30 and I was exhausted and happy to be home and half asleep on the couch.